This rendering depicts a concept for the new Copper creek Villas & Cabins at Disney’s Wilderness Lodge, which go on sale to Disney vacation Club members on March 8. Disney Vacation Club members looking to own a piece of Walt Disney World’s newest DVC resort should mark March 8 on their calendars as the start of sales for Copper Creek Villas & Cabins at Disney’s Wilderness Lodge. 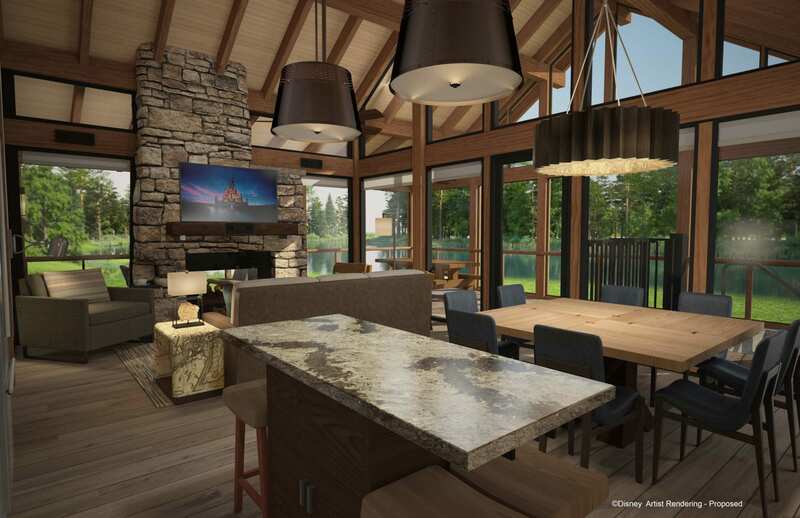 Disney Vacation Club has announced that sales for Copper Creek Villas & Cabins at Disney’s Wilderness Lodge, the latest resort in its portfolio, will begin on March 8 for current Disney Vacation Club Members, with general sales following on April 5. Copper Creek Villas & Cabins offers guests a “new frontier for magical vacations where the comforts of home and the wonders of the wilderness are deeply rooted in the magic of Disney.” Inspired by the legendary mining and railroad history of the Pacific Northwest, guests will come “home” to rustic elegance, where cozy touches mix with modern designs. Copper Creek Villas & Cabins features 184 modern, nature-inspired vacation homes, including Deluxe Studios, one- and two-bedroom Villas, and three-bedroom Grand Villas, which sleep up to 12. Each unit offers well-appointed kitchen areas, expanded storage space for belongings, private patios or balconies with scenic views, and natural finishing touches throughout each room. Copper Creek Villas & Cabins also includes 26 all-new luxurious waterfront cabins. Sleeping up to eight and featuring two bedrooms, two baths and large dining and living room spaces, the cabins’ floor-to-ceiling windows, exposed wooden beams and interior-exterior stone-hearth fireplace bring the beauty of the outdoors in, offering plenty of room for families. After a day at the nearby theme parks, guests can return to their porch to take in the fresh air and relax in the built-in hot tub, and for some, enjoy the Electrical Water Pageant on Bay Lake and firework views from the Magic Kingdom. While staying at Copper Creek Villas & Cabins, guests will have shared-access to all of the amenities and activities available just steps away at Disney’s Wilderness Lodge. The recently opened Geyser Point Bar & Grill offers picturesque views of Bay Lake, as well as food and spirits in an open-air lounge. The menu highlights an array of flavors from bison burgers with Tillamook cheddar and a house-smoked salmon BLT with lemon-caper mayonnaise to small plates, craft beers and signature cocktails in the lounge. Roaring Fork, the resort’s original quick-service restaurant, will reopen later this year with a refreshed look and expanded outdoor seating. Later this summer, the new Boulder Ridge Cove Pool will open as part of Boulder Ridge Villas at Disney’s Wilderness Lodge. This “modern-day swimmin’ hole” features a zero-depth entry point. The all-new Salon by the Springs for pool-side manicures, pedicures and hair services. Additionally, a brand-new sports court, BBQ pavilions and a refurbished fire pit and movie area also join the lineup of resort amenities all slated to open in the summer.